David specializes in Electric Bass and Upright Bass. He teaches various guitar styles including Jazz, Soul, Funk, Rock, Gospel, Blues, Experimental, Latin Jazz and Brazilian at the Shine School of Music. 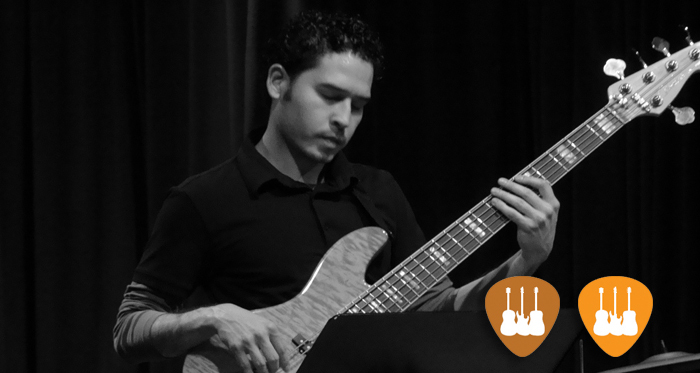 Born in Monterrey, Mexico in 1979, David studied classical Bass at ESMD. He participated in various orchestras during his youth and continued to study Jazz and Electric Bass. David played in the musical “El show de los diez pianos” which toured the U.S, Mexico, as well as Central and South America. He also participated in other musical projects including the Pop & Rock band “Alas de Aquila”. David regularly worked as a session musician, participating in several recordings. In 2006 he relocated to Barcelona to complete courses at the Aula de Música Moderna and at the Conservatori del Liceu where he studied Jazz. That same year David won the scholarship for the Berklee World Tour. The AIE awarded him a grant for 3 consecutive years and allowed him to continue studying electric bass with Jordi Ruiz at the same time, conducting masterclasses with Gary Willis. David continues to participate and perform as part of various musical group, playing in Jazz & World Music Festivals, among them: Barcelona Gospel Messengers (Festival Vijazz), Soultime Kena Toledo and Jordi Bonell (Barcelona Jazz Festival), Ivan Illic Trio (Jazz Festival Nisville Belgrade and the Kosovsca Mitrovica Jazz Festival), Muriel Grossmann Cuartet (Ibiza Jazz Festival), Baiao Brasil (Gira Diversons La Caixa), AxisOrca (Vic Jazz Festival). He currently plays with several projects as bassist and bass. Listen to some of his music here!